Spinach is a leafy green vegetable that grows best in cool weather. Usually thought of as being packed with iron, spinach is even higher in vitamins A and C, thiamin, potassium and folic acid (one of the B complex vitamins). Spinach, like most dark green leafy vegetables, also contains the carotenoids lutein and zeaxanthin. Oh, and it tastes great eaten fresh or cooked. All spinach is grown for its dark green leaves. While there are many different spinach varieties with an assortment of leaf shapes and textures, spinach is usually divided into 2 major categories: smooth leaf and savoy. Since they've been crossbred so much, it's often hard to categorize them. Small-leafed spinach or baby spinach has gained in popularity recently. These are not necessarily immature spinach leaves, but varieties that simply don't get large. 4 to 6 weeks from seed. You can begin harvesting whenever the leaves are large enough for your taste. Spinach can be harvested in the cut and the come again method of harvesting lettuce. Cut individual leaves, starting with the older, outer leaves, and letting the young inner leaves remain and continue growing for a later harvest. You can also cut down the whole plant, for a larger harvest. If you cut about an inch above the crown or base of the plant, it is very likely the plant will send out a new flush of leaves. Spinach, especially the crinkled leaf varieties, hangs onto the soil. Wash well before using. Spinach leaves are very sensitive to the ethylene gas given off by many fruits. Don't store in the refrigerator with apples, melons or tomatoes. Spinach can be frozen for later use. Wash the leaves well and allow them to dry somewhat before placing in a resealable freezer bag. Then zap them for about 1 minute in the microwave, on high. Allow to cool slightly and place in the freezer. Best used within 3 to 6 months. Since spinach is grown when the weather is cool and damp, several fungus diseases, like downy mildew (blue mold) and fusarium wilt, can become problems. 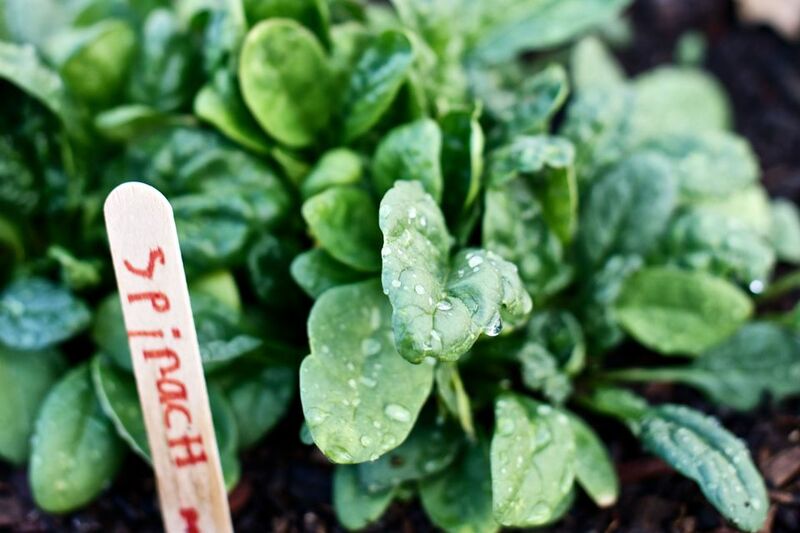 Space your spinach plants, so they get good air circulation and try to keep water off the leaves in the evening. Aphids pose a risk because they can spread viruses. Monitor for aphids regularly and hose them off immediately. Several 4-legged pests, rabbits chief among them, will also raid your spinach patch. Fall Planting: 'Avon,' 'Indian Summer,' 'Melody,' 'Razzle Dazzle' and 'Tyee. New Zealand spinach (Tetragonia tetragonioides) - Close in texture and taste, but in a totally different vegetable family. Malabar spinach (Basella alba) - An unrelated vining plant that can take more heat. Pick young, or the leaves take on a slimy texture. Soil: Spinach prefers a well-draining soil with a neutral pH and won't be happy at a pH lower than 6.0. Because it is such a fast grower, it is also a heavy feeder. A fertilizer high in nitrogen, the first number on the fertilizer package, will help produce dark, healthy leaves. Fish emulsion and soy meal are good organic choices. Planting: You can start spinach indoors or direct seeded in the garden as soon as the soil is workable. Spinach grows quite quickly, so don't start plants indoors more than a 2 to 3 weeks before you plant to transplant them out. Spinach also matures and goes to seed quickly, so it is better to re-seed every couple of weeks than to try and plant a large crop to harvest over time. Sow the spinach seeds thinly in rows spaced about 1 to 1 1/2 ft apart or simply scatter the seeds in blocks. Cover lightly with soil, firm in place and water well. Keep the soil moist until germination. Once the plants have a grown their true leaves, you can begin to thin the plants to about 6" apart. Of course, you can eat your thinnings. As the weather warms, spinach plants will bolt more quickly. Expect to stop sowing spinach seeds sometime in May or June, depending on your climate. You can extend the season slightly by planting in the shade of taller plants and regularly watering your spinach plants. Fall Crops: Spinach also grows well in the cool, short days of fall. Start seeding again at the beginning of August. Keep the seedlings shaded and watered and in the summer heat, and they should be ready to harvest beginning in September. Overwintering Spinach Plants: You can continue sowing spinach seeds late into the fall season. In warmer climates, you could quite possibly be harvesting well into winter. If the ground freezes before the plants mature, mulch them with hay and leave them be until the temperatures warm again in spring. Remove the mulch, and the plants should resume growing, giving you an even earlier harvest. Growing Spinach in Containers: If space is tight or rabbits are many, you can easily grow spinach in containers. Even a relatively small 10 to 12" pot or a window box will do. Plant as you would in the garden. You will need to water more frequently since containers dry out faster. Interplanting Spinach: We wouldn't advise tucking spinach in a flower bed since too many critters will make a snack of it. You can, however, take advantage of the shadier spots of a fenced in vegetable garden, where most other vegetable plants would languish. As mentioned, you can also grow spinach in the shade cast by taller vegetable plants and near plants that will begin spreading out as the spinach finishes its season, like pole beans and corn.